I learned several years ago the MUS found on military tombstones for Civil War soldiers, like the one pictured at right for William Worth Beall, stood for Musician. But there was no such stone for Alva B. Spencer at his burial site in Harmony-Smyrna Cemetery at Dooly County, Georgia. Alva's tombstone, in fact, had no mention of his service at all. At the base, from which the tablet has somehow been separated, is an information card placed by (my guess) a relative of Mr. Spencer's. This adds that Alva was married to Margaret Lucinda Cone, as well as that he was a member of Company C, 3rd Regiment Georgia Volunteer Infantry. Alva, born 6 September 1840 in Greene County, Georgia, was a son of Benjamin E. and Charlotte G. Spencer. Prior to his service in the Confederate States Army, Alva attended Mercer College at Penfield. He was a sophomore in 1856. By the 1860 U.S. Federal census, Alva was a school teacher in Greene County. When I finally looked at Alva's Confederate service record at Fold3, I discovered he was a musician. While noted with the rank of Private on 1861 and mid-1864 muster rolls, the file also shows Alva "detached" or "detailed" in Brigade Band at these times. Later in 1864 and through to February 1865, he was noted as MUSC, MUSCN, and Musician. Alva surrendered at Appomattox Court House, Virginia 9 April 1865 (noted as Pvt). Alva B. Spencer died at the young age of 40 years in Dooly County, Georgia 20 May 1881. Well done for today's letter! Very clever and a lovely ode. Great post - I'm always fascinated by what certain words or symbols mean on graves so now I can add this to my knowledge. 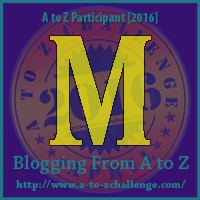 For A to Z, looking in on your very interesting blog.